All Great Change in America begins… where? At the Dinner Table! Thank you Mr. Reagan for those wise words. I hope you didn’t think this would be a political post. Throughout our engagement, I reminded Andrew that we needed to buy a dinner table with our wedding money. Before all else, a dinner table was priority to me. It stood for the beginning of our family, and we want a big family (we think). I wanted it to be big, bold, and beautiful. I dreamed of hosting dinner parties and enjoying the company around our new table. I dreamed/feared that my LG’s would someday be doodling all over it with Sharpies. It has to be perfect. Andrew didn’t so much see the necessity in it, afterall… We can sit on the couch for dinner right? Ehhhh, not every night. So, here’s my mind.. for months really. Bench or no bench? 6 seats or 8 seats? Wood? Glass? Black? Brown? White? So, we looked all around. Hubs knew it meant a lot to me. I am picky about some things, I’ll just say it. Picky me. I can’t tell you exactly what I want, but I can tell you when I see it. I’ll know. I’ll know if I think it’s worth the price, I’ll just know! Like many, I love Pottery Barn. I love the look, the colors, the textures. I don’t love the price. I mean, we just graduated and got married, it’s not worth THAT much to me. We went to Ikea, they have cute stuff… I was almost convinced for the price, but I didn’t lovveee it. I liked it, yes, loved it no. Andrew knew this, so he suggested we wait. 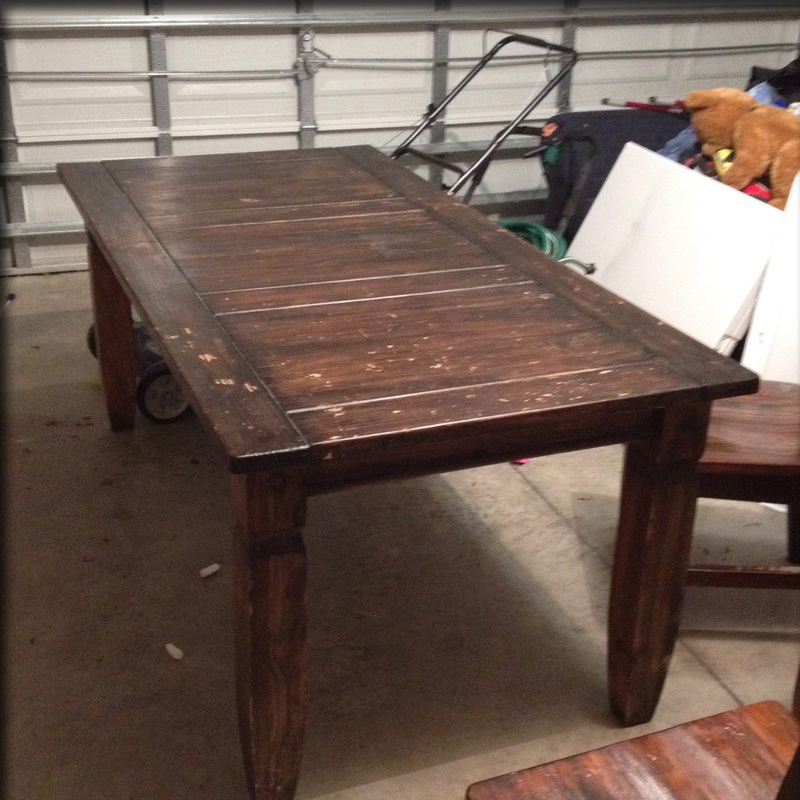 I cruised Craigslist daily looking for a table that would fit my fancy. And one day, I found one. 100 bucks, solid wood table with six chairs from Pier 1 Imports. Hmmmm. I think I’ll take a look. I thought I could do it in a week. I thought I could do it in a month. I definitely thought I could do it by the end of summer. I did the later, it was done in August. It would have been sooner, but the heat in the garage was a real downer! The stripper didn’t seem to like that or our high humidity here. 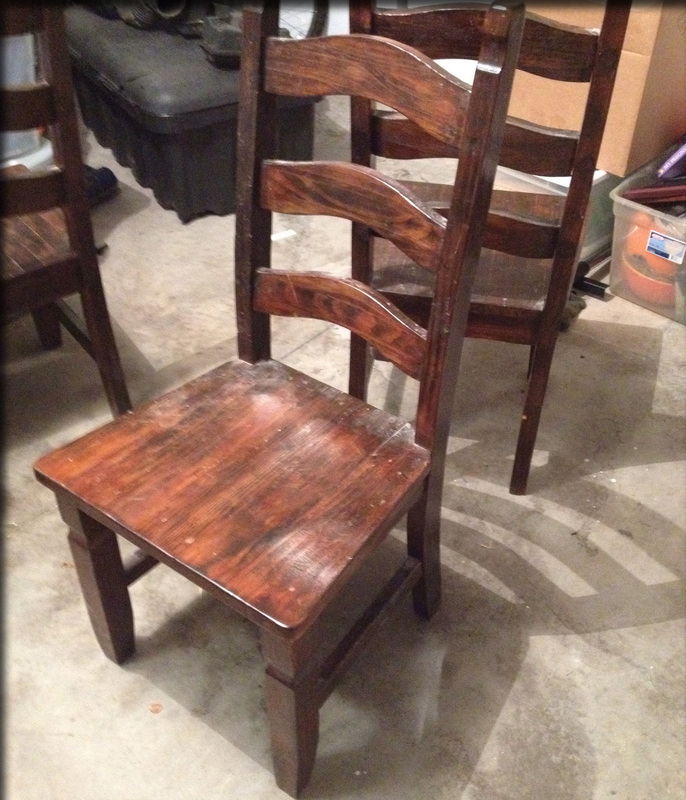 Not to mention, there were 3 coats of stain on the chairs! 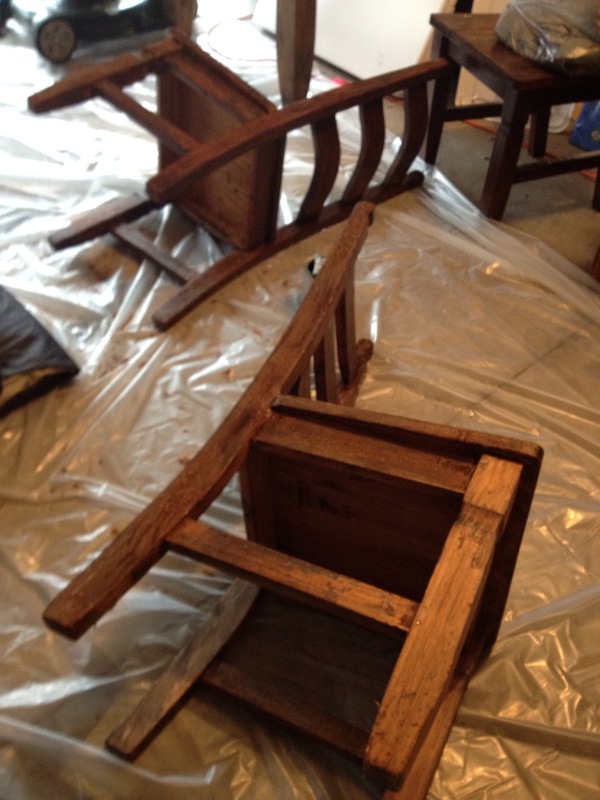 The previous owners had stained the chairs, but not the table. I didn’t take many photos through the process apparently. There’s actually not one of me working on it. But, I swear I did it! All by myself even. Looking back, I wish I had taken more photos. I put a lot of love and thought into this table. I wanted it to define us, Andrew and I. We’re very different in styles. I like naturals, warm colors… I like things that look like they tell a story. He likes a more modern look, often more primary colored things, straight lines. He would like something like this, where I would love something like this. Then I thought, why not combine the two. I’ll do black chairs, with a wooden table. Turns out that’s a style too.. Unfortunately, I’m not the first. 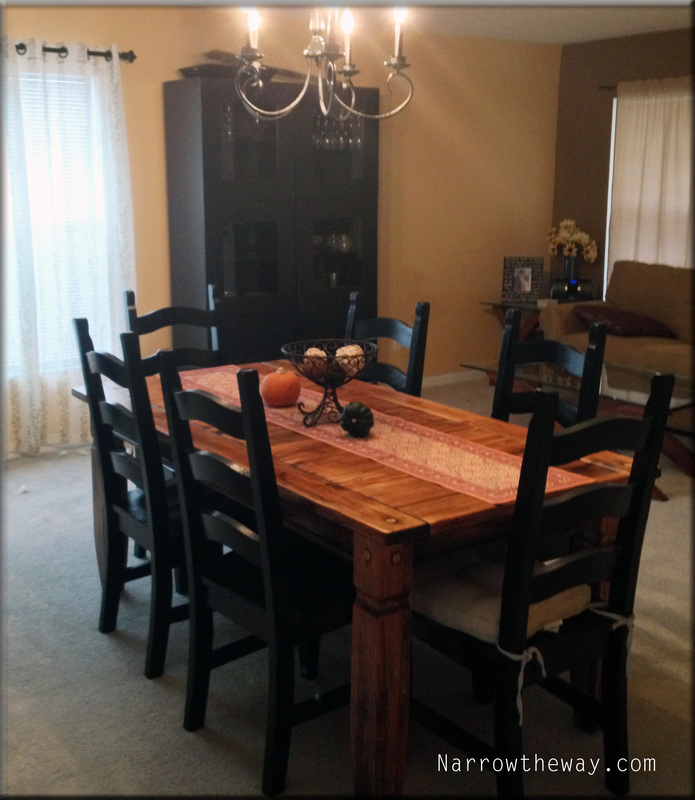 We have this black cabinet, so it would tie that in… plus I still get a lovely table. I think it turned out great – Andrew even likes it! I even painted (and swagged!) our ugly light fixture to match the new table, it’s slightly less ugly now. I’ve only actually eaten at the table once since finishing it (Shout out to the Perin’s!). I love it. It’s not what I wanted originally, but it’s different, in a good way. It’s more “us”; it has more of a story. I put many hours into it and I hope it shows. I don’t know if it’s because I work at a restaurant where the table is an integral part of the dining experience (ha). Or because I think back on the nights my family used to all eat at the table for dinner. Those are the nights I remember, I don’t remember the nights in front of the television. I remember the nights with people, the nights I’ve sat with friends and family, just enjoying and learning from each other. Your mother and I need to get back to eating together at the table…I am glad you remember those times – on the occasional night I was home. Of course. I’m excited for Christmas! I can’t wait to cook! It looks great! You can tell that a lot of work went into it!